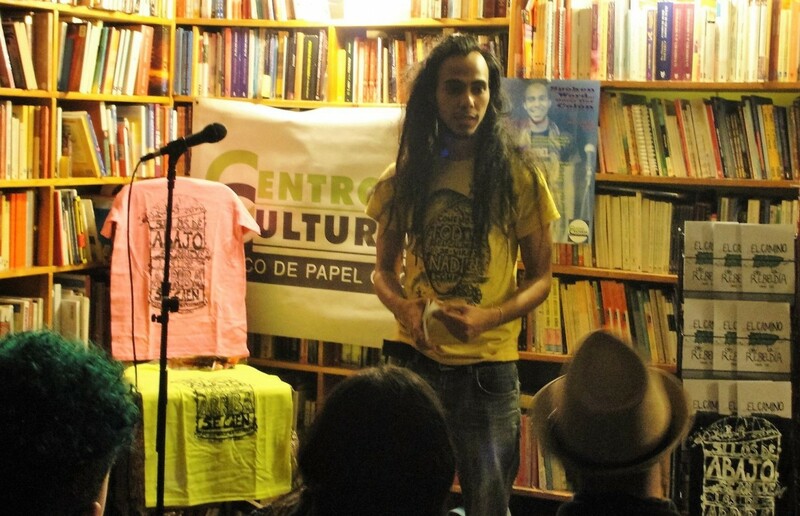 Puerto Rican artist and poet Omar Iloy Colon presented his poems at Barco de Papel in a show that blended rhyme, rhythm and performance. The event called “Spoken Word” was swarmed by local young poets attracted by the growing positive feedback that Omar has received in Puerto Rico, who has been described as “one of the more independent, creative and deep emerging voices of the island” (1). Find Event Photos in our Facebook page. Omar I Loy Colón Muriel (Río Piedras, Puerto Rico 1988), grew up between the cities of El Paso, Texas (USA) and Puerto Nuevo, San Juan, Puerto Rico. He began his studies at the Central School of Visual Arts and in 2006 he joined the theater ensembleTeatRUM at the University of Puerto Rico. It was there where he began his political activism. He graduated in 2011 with a bachelor of arts in literature. As a multifaceted and talented artist, he draws for commission, joined the group Lengua Sorda (Deaf tongue) in order to express his personal take on the “impronza” movement (improvised poetry fused with performance). In 2012, his work’s popularity grew like wildfire after a Youtube broadcasting of his poems “Líneas desde abajo” y “La rebeldía fuma pasto“. That success led him to new artistic endeavors, where he focused his attention to other themes like race, social class, gender and colonialism, ideas not only expressed through poetry but also fused with artistic projects using original designs (plataforma cibernética Lxs de Abajo ). He published a book of poems called “El Camino de la Rebeldía” (Path to Rebellion) in 2015. (1) Daniel Nina in El Post Antillano of Puerto Rico.